I was very interested in the quite literally mouth-watering flavor combination I’ve used in this recipe for a while, and for some reason thought it would be best in a cupcake. 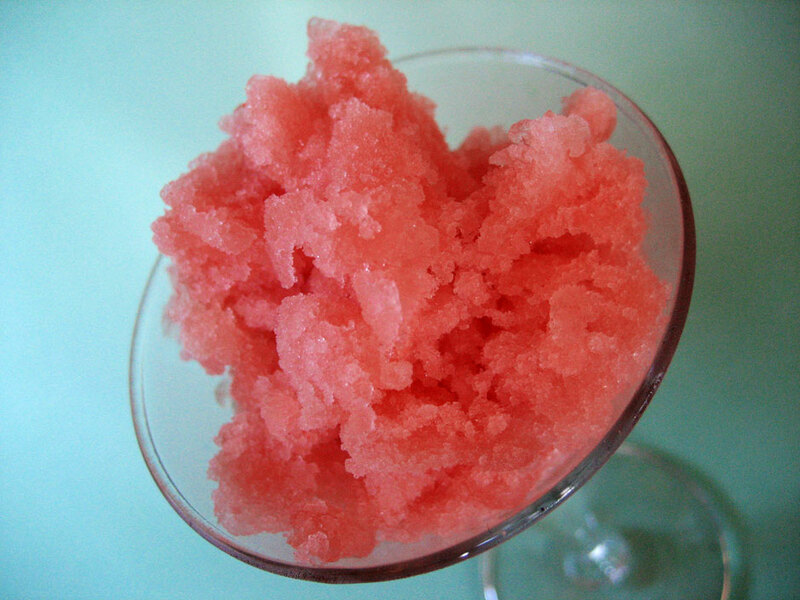 More of a shaved ice than a sorbet, but that's what you get when you don't cook down your watermelon juice because it's 3 in the morning and seriously why are you still up making sorbet. Though it would still make a fun cupcake, I think the combination of juicy watermelon and strong black tea must reach its fullest potential in a frozen application. So, obviously, that is what I did. I picked up a large (not the largest but I had a hard time lifting the one I did buy) watermelon on sale at the store a few days ago and, while downstairs at one in the morning one night finishing up another edible project of mine, decided I might as well churn up some sorbet while I was in the kitchen. Probably my cheapest, easiest and healthiest dessert yet! I used the recipe for watermelon sorbetto in the Perfect Scoop as my guide, noticing but choosing to ignore the step where you cook down the watermelon juice. That could be considered a mistake, but honestly I’m perfectly happy with my results. You know what happens when you put watermelon in the blender? Right, you get that froth on the top half and a rich pink juice on the bottom. Well, even if you blend it very, VERY well with tea, sugar and vodka, it will re-separate in the machine when you churn it. So even though most of it is fluffy, icy and awesome, there will still be some of that pink juice unfrozen an the bottom. And when you pour it all into a container, even if you stir it up good before chucking it hopefully into the freezer, it will freeze very solid. So solid that you’re going to have to scrape at it instead of scooping it. Oh watermelon, how I love you. 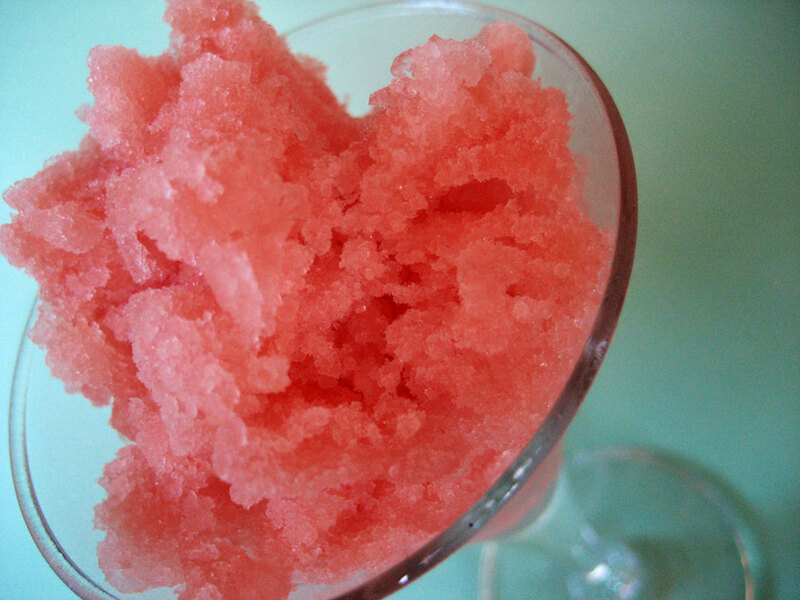 Which, as you can see, results in a kind of shaved ice. With the texture of snow, a blast of refreshing sweetness from the melon and a lingering taste of good, strong black tea. And that is perfectly acceptable to me. Melts like snow, tastes like tea & melon. Once your watermelon is pureed, add the other ingredients to the blender (provided you have one big enough – if not, dissolve the sugar in the tea while hot and stir everything together thoroughly in a large mixing bowl) and blend until combined. Churn in an ice cream maker (you could try this without one but you’d probably get really huge, unappetizing ice crystals unless you stirred it every five minutes) and freeze in a large, sealable container until hard. Scrape shavings with a broad spoon and serve in nice little glasses on a hot summer day. This is really delicious and very cheap to make, provided you have the vodka on hand. 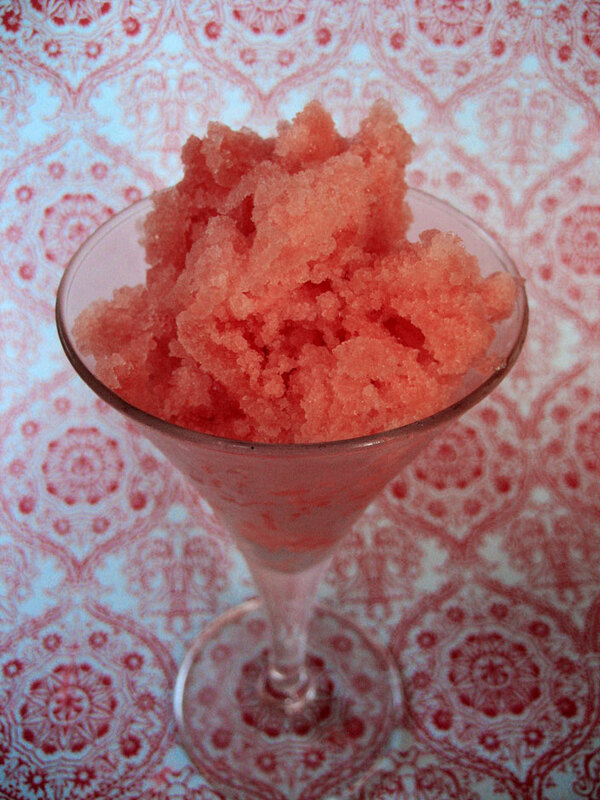 I think I’d like to try the watermelon and tea combination as a granita next time – considering the shave-y characteristics of this sorbet I think it would turn out perfectly. That’s it – I’m getting this book! Much too awesome sorbet; I may just take my tea this way from now on. My ice cream machine is ready to go. This sounds perfect for a hot evening! That looks so refreshing, Anna! When it starts to warm up over here, I’m going to come back to this recipe. 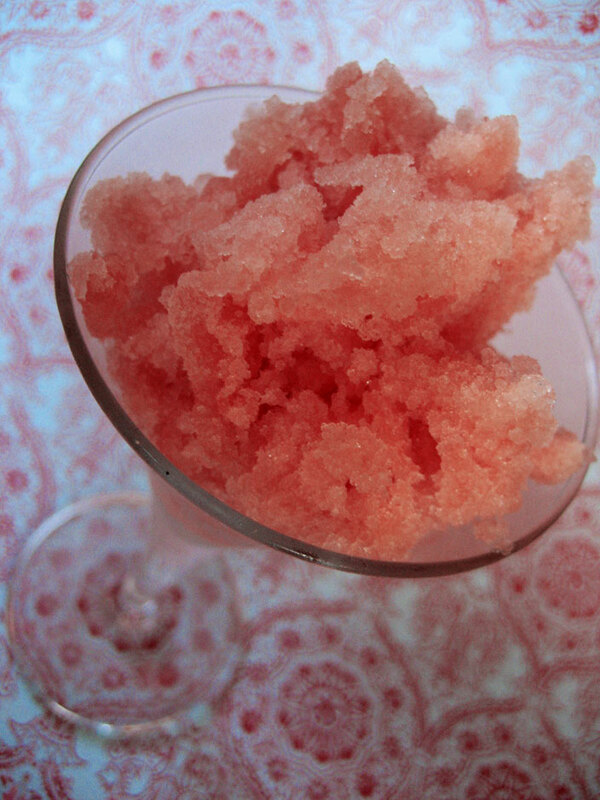 Shaved ice works for me… especially if it’s that shade of pink, heh. Though I’m intrigued by the cupcake idea you mention… sounds like a fun flavour combination! hmm, i bet that vodka had something to do with the nonfreezing factor. when it tastes that good, though, who cares? black tea and watermelon: such a good idea.